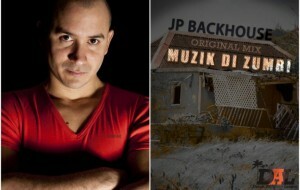 JP BACKHOUSE uses Caribbean history to make Caribbean magic! Jimmy Bakhuis, artistically known as JP BACKHOUSE, always had and continues to have a special interest in the creation and layout of musical sounds. He will never forget that day at the age of 13 when he attended a “muzik di zumbi” work shop trough his middle school when he lived in Curaçao. You can find out more about his experiences growing up in his native island here. Muzik di Zumbi is an ancient music genre that was played among the slaves in Curaçao. Jimmy got intrigued by one ancient string instrument called the “benta”, which is a bent tree branch with a string attached to it, crafted in a very specific fashion. The string is struck with a small object and resonates in the mouth. This produces a very robotic futuristic type sound and this sound changes when you change the shape of your mouth. If played in the right way it can send you in a trance like state when accompanied with African drums. This is the recipe for the ancient slave music genre called “Muzik di Zumbi”. In his similarly titled dance track Jimmy recreated a benta like sound with his synthesizer and added some of his magic to it to make it fit in an Urban EDM type track while keeping the somewhat eerie yet uplifting vibe of the original ancient genre intact. Along with heavy percussion, off beat snare drums and energizing synthesizer action, JP BACKHOUSE produced a multi influenced track bound to make all the dancefloors get wild and loose. Gerson Eleonora (1987) has a passion for writing, whether it be short stories, poems or the biographies, reviews and music articles displayed here on the site. He is an aficionado of everything Caribbean, it’s almost as if salt water runs through his veins.